Kick, Russ (ed). Choose one graphic novel from The Graphic Canon, Volume 1 and read the original version, then the graphic novel version. Braun, Linda W., Hillias J. Martin, and Connie Urquhart. (2010). Risky Business: Taking and Managing Risks in Library Services for Teens. Chicago: American Library Association. Brenner, Robin E. (2007). Understanding Manga and Anime. Westport, CT: Libraries Unlimited. Cart, Michael. (1996). From Romance to Realism: 50 Years of Growth and Change in Young Adult Literature. New York: Harper Collins. Cart, Michael and Christine A. Jenkins. (2006). 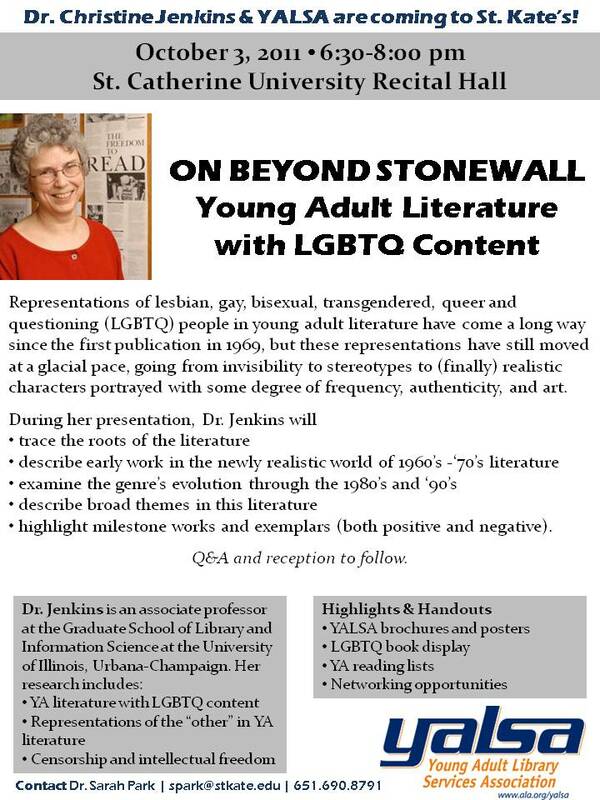 The Heart Has its Reasons: Young Adult Literature with Gay/Lesbian/Queer Content, 1969-2004. Lanham, MD: Scarecrow Press. Chambers, Aidan. (1985). Booktalk: Occasional Writing on Literature and Children. New York: Harper & Row. Flowers, Sarah. (2011). Young Adults Deserve the Best: YALSA’s Competencies in Action. Chicago: American Library Association. Goodstein, Anastasia. (2007). Totally Wired: What Teens and Tweens are Really Doing Online. New York: St. Martin’s Griffin. Harris, Frances Jacobson. (2005). I Found It on the Internet. Chicago: American Library Association. Hine, Thomas. (1999). The Rise and Fall of the American Teenager: A New History of the American Adolescent Experience. New York: Perennial. Horning, Kathleen T. (2010). From Cover to Cover: Evaluating and Reviewing Children’s Books. New York: Collins. Ross, Catherine Sheldrick, Lynne McKechnie, and Paulette M. Rothbauer. (2006). Reading Matters: What the Research Reveals about Reading, Libraries, and Community. Westport, CT: Libraries Unlimited. Wolk, Douglas. (2007). Reading Comics: How Graphic Novels Work and What They Mean. Cambridge, MA: Da Capo Press.